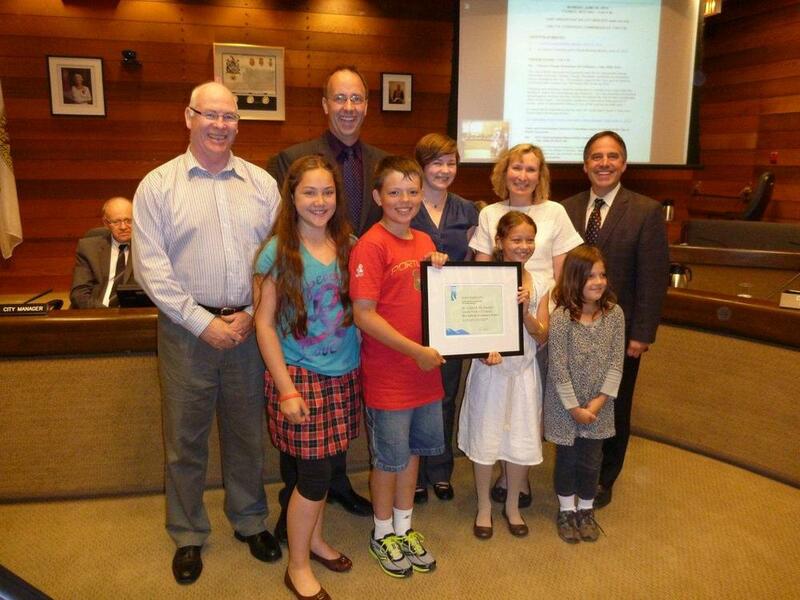 Here are a couple of pictures from the Environmental award night on Monday night at the City of North Vancouver's Council Chambers, presided over by Mayor and Council. Our classes are — no kidding — some of the best educated and most knowledgeable students when it comes to the importance of bees and the connections between food, pollination, bee habitat, and how to be BeeFriendly! 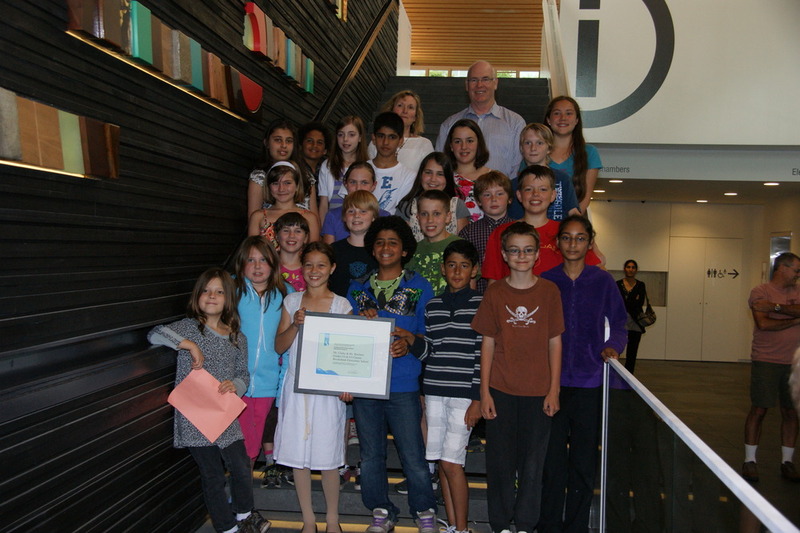 It was so nice for the children to receive the honour and recognition they so richly deserve. Thanks to those parents whose schedule allowed you to be present on Monday night. It was a memorable event! Apart from the handing out of report cards on the last day of school (Thursday 28 June 2012), I have one task left, and that is to say what an honour and a pleasure it has been to teach your child. We had a very fun year together, with lots of learning, growing, maturing, and laughing along the way. Many thanks for your support, kindnesses and encouragement. You've all helped me be a better teacher. Have a safe and fun summer holiday! Below is a link to a slideshow from the Grade 6's week at Outdoor School. Memories, memories, memories! Still 6pm, all other details as previously advised. If you and your child can attend at Council Chambers next Monday 25 June, that would be wonderful! in attendance to accept the award…"
I haven't even had a chance to inform the students yet, but I intend on attending, as will Ms. Reichert, and we would like as many students and parents as possible to be there to receive the Mayor's congratulations. For a young person, it is quite something to visit the Council Chambers, and to be singled out for honourable achievement can leave a lasting positive impression. Please try to attend if your schedules will allow at this busy time of year. In a related way, we had our last bee session with master Beekeepers Ric Ericson and Sharon Lisette today. We went out into the garden near the community farm at Loutet, and did a little weeding around our lupin seedlings, then went bee-observing, and saw several, notwithstanding the cool temps and rain. When we returned to the class, I asked each student to relate something important they learned this year from Ric and Sharon. You should have been here to hear what a smart and educated group of students we have! It was so impressive what they know! Collectively our class has learned so much about the environment, bees, and the connection to nature. In other news, we are still collecting permission forms for our year-end trip to Eileen Dailly pool on Monday June 18. We will need drivers that day to drop off and pick up and I'd like a few parents who might be able to stay. Thanks to those whose schedules will allow them to help us out. Much appreciated! Speaking of appreciation, this Thursday morning Brooksbank staff is inviting all those parents who help out volunteering in our school in any capacity (driving to field trips, serving on the PAC, helping with hot lunch days, reading to students, etc., etc.) to come to a reception in the library from 8:30 a.m. on Thursday 7 June, followed by a series of "thank you" performances from 9:00 am in the gym from each division (which should take about 30-40 minutes). We are late in making the invitations in our class, but I do hope you can come! Next week (June 11-15) our Grade 6s go to Outdoor School from Monday to Friday, and I'll be going with them. Our intrepid Gr. 6/7 teachers, Mrs. MacKay and Mrs. Dolan, who will be staying behind here at Brooksbank, have planned with me so that the Grade 5s will have a pretty good week themselves while the Gr 6s are away… not as much fun as the Gr 6s will have at Outdoor School, because that is truly a memorable week, but the Gr. 5s will still have fun.